In 1997 a new brand called ‘Green People‘ made it into some UK health stores. The idea came about in 1994 when the creator’s daughter had many skin allergies and eczema and was searching for a solutions or a product to help. Today Green People have many different products for men, women and children, these products help different people with specific needs. Here are a few products that show they try to cater for everyone’s skin needs! This is Green People’s ‘Sensitive Skin Solution Kit‘. It contains three scent free, cruelty free products (did we mention Green People are cruelty free?). The products in this kit don’t contain any essential oils, parabens, SLS, phthalates or any nasty artificial ingredient that could risk irritating your sensitive skin. This organic skin care is enriched with lovely ingredients such as shea butter and avocado. 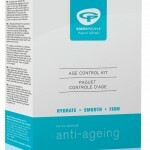 The next product is their ‘Age Control Kit‘. The products in here help reduce the appearance of fine lines and restore a natural radiance to your skin, and it’s organic, and suitable for Vegetarians and Vegans. The products in this kit are enriched with ingredients such as seaweed and evening primrose. Of course there’s not any nasty ingredients in there as it’s free from things like parabens, SLS, phthalates and artificial colours or fragrances. The last (but by no means least) product we’re looking at is their ‘Blemish Control Kit‘. Like many of Green People’s products this kit is certified by EcoCert. The aim of this kit is to reduce the appearance of blemishes and large pores. These products are enriched with nice natural ingredients such as pineapple and hazel. Again any nasty ingredients that could irritate your skin have been left out. So Green People really do cater for many of your skin needs! They have a lot of other handy products too, like toothpaste, shampoo and supplements, they don’t just do skin care! Have you tried any Green People products? Let us know what you think.